Prefer to get started by watching a video? Check out our Java SMS Quickstart video on Youtube. Now that you have a Twilio account and a programmable phone number, you can start writing some code! To make things even easier, we'll set up our Java environment and then download Twilio's official helper library for Java applications. Already have your Java development environment all set up, and have a Twilio Java Helper library configured in your classpath? Feel free to skip the next two sections, and get right into sending your first text message with Twilio! The Twilio SDK requires Java SE 7 or higher, which will appear as version number "1.7" or above when you run the above command. Got Java all set up and ready to go? Fantastic! This Twilio Java helper library is not meant for use in Android applications! Use this library for servers, command line applications, and similar projects. If you want to send an SMS from a mobile application, you should have a server component with your Twilio credentials where your app sends an HTTP request. Shipping your Twilio Account SID and Auth Token to end users is a security risk for your Twilio account. Now that we have the JDK setup and the Twilio Java Helper library downloaded, we can send an outbound text message from the Twilio phone number we just purchased with a single API request. Create and open a new file called SmsSender.java and type or paste in this code sample. Open SmsSender.java and replace the values for ACCOUNT_SID and AUTH_TOKEN with your unique values. We need to include that Twilio jar with the dependencies to compile our class from the command line. If you are using an Integrated Development Environment (IDE) such as IntelliJ IDEA, Netbeans or Eclipse, you can simply add that Twilio jar to your classpath or your project libraries like any other dependency. You can also use a build tool like Maven or Gradle to build and run your Java application - just specify Twilio's helper library as a dependency. The difference is that on Windows, the Java classpath separator on the command line is a semicolon, and on macOS or Linux, it is a colon. I sent the message! How do I receive them? Let's see how we would build this in Java using the Spark web application framework. Spark is a lightweight web application framework and is completely different from the big data software named Apache Spark. You can certainly set up all of your dependencies on the command line like we did when we sent the SMS through Twilio above, but it's a little easier to get everything set up using a Java integrated development environment (IDE). 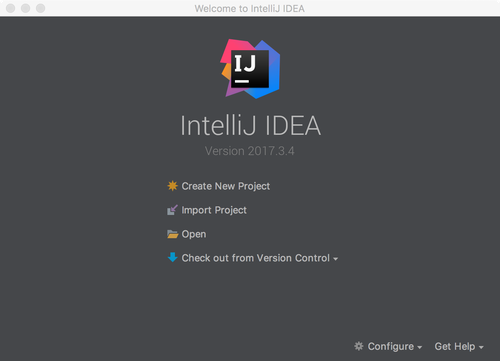 We are going to use the free, community edition of IntelliJ IDEA, which you can download from JetBrains. 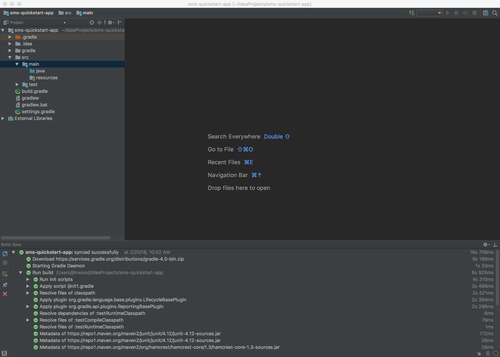 You can download JAR files and use them directly with IntelliJ IDEA, or you can use a dependency manager such as Maven or Gradle. 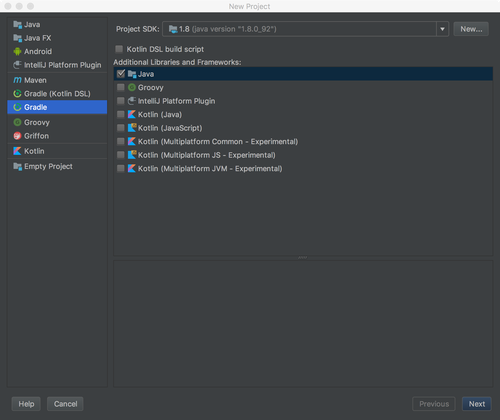 We will use Gradle with IntelliJ IDEA to build our application. 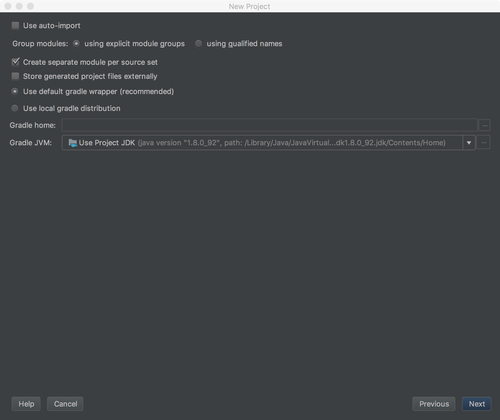 On the left-hand side of that dialog box, choose Gradle (instead of Java), so that IntelliJ IDEA will set your project up to use Gradle for dependency management. You could also choose to use Maven here instead - the process is almost the same. 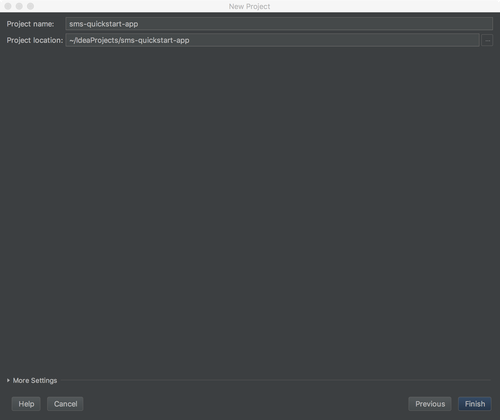 After choosing Gradle, verify that IntelliJ IDEA has a project SDK (you'll need Java 8 or higher, so version 1.8 or above), and then click Next. On the next screen in the wizard, you will be asked for a group id, an artifact id, and a version number. For the group id, you can use a reverse domain name, such as com.yourcompany.sms, and for the artifact id, you should use your project name, like sms-quickstart-app. You can leave the version as 1.0-SNAPSHOT. After filling in these fields, click Next. On this Gradle settings screen, you can leave the defaults and then click Next. Last, you can confirm the project name and project directory to use for your Quickstart web application. The defaults are probably fine here as well. Clicking Finish will take you to your new IntelliJ Project. If you just installed IntelliJ IDEA, the IDE will download Gradle and do some setup and installation. Now that we've got our project all set up, we just have a few more steps! We'll need the Twilio Java helper library, and the Spark Java web application framework as dependencies, along with the logging implementation so that we can see status messages from Spark. With Gradle, we can add those to the build.gradle file that IntelliJ created for us. Go ahead and find build.gradle in the sidebar and click on it to open it. Now that we have all of that out of the way, it's time to write some code! A small popup window will show, and you can create a new class. Name your class SmsApp - capitalization is important because it has to match the code sample. You should have an SmsApp.java source code file now. Copy and paste the code from the code sample into that source code file. This Java code will listen for inbound HTTP GET requests to '/', respond with "Hello Web," and listen to inbound HTTP POST requests for '/sms', and respond with TwiML markup for an SMS Message. After you get your code in place, you can right-click on the SmsApp class in the project outline on the left-hand side, and then choose the Run 'SmsApp.main()' menu item. The Java spark web application server will start listening on port 4567. You can try it out by going to http://localhost:4567/ in your web browser. One important thing to note - if you make a change to your code, and want to run the server again, you will need to stop the currently running application with the red stop button. Only one application can use port 4567 at a time, so if you run your Java application while an older version is still running, the new application will immediately exit. You'll need to make your application accessible over the internet. While you can do that in any number of ways, we recommend a tool that provides an externally accessible URL called ngrok. We'll show you how to set that up next so your app can receive messages. We’ve just built a small Java web application to receive incoming messages. Before it will work, we need to make sure that Twilio can reach our application. When you’re working on your Java web application in your development environment, your app is only reachable by other programs on your computer, so Twilio won’t be able to talk to it. We need to solve this problem by making your application accessible over the internet. Now we have a new external URL. Log into Twilio.com and go to the Console's Numbers page. Click on your SMS-enabled phone number. Find the Messaging section. The default “CONFIGURE WITH” is what you’ll need: "Webhooks/TwiML". Save your changes - you’re ready! With both of those servers running, we’re ready for the fun part - testing our new Java web application! Now that you know the basics of sending and receiving SMS text messages with Java, you might want to check out these resources.